METAL ALLEGIANCE began in 2011 with the goal of bringing together some of metal’s greatest musicians to perform and brainstorm new material, as well. After several years, the artists of METAL ALLEGIANCE are releasing their self-titled debut album on September 18, 2015. The record will feature 9 new songs, the Deluxe Edition to include a cover of DIO’s “We Rock”. As one might expect, the music on this record spans quite a bit of the metal spectrum, but all the while remains very heavy. There’s everything from thrash, to modern, to progressive metal on this release. Every song on the record feels right at home, though. Nothing sounds out of place. 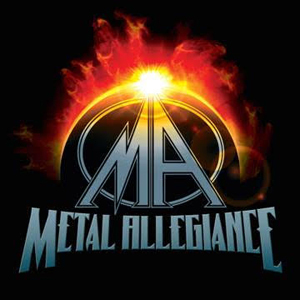 Though METAL ALLEGIANCE is made up of quite a few members, four in particular make up its core: Mike Portnoy, David Ellefson, Alex Skolnick and Mark Menghi. They, along with all of the members of METAL ALLEGIANCE, are to be commended for their efforts. METAL ALLEGIANCE’s self-titled debut is an incredible album and an absolute must-have in any metal fan’s collection. Pre-Order your copy of Metal Allegiance in the KNAC.COM More Store right HERE.